Headlines: Lake Jindabyne has turned on some good polaroiding and Lake Eucumbene has been excellent on the troll. Boat launching in Eucumbene is available at Old Adaminaby, The Dam Wall and Buckenderra. Lake Eucumbene:- Fly reports have been quiet from the dam but polaroiding is a good technique on the right day. 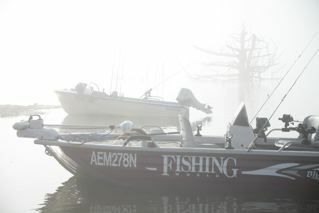 Searching with a streamer on an intermediate sinking line, will find you fish during the day if visibilty is limited. Best area to do this is the dam wall and some of the steeper shores adjacent to this. Try using Olive Matukas, Beadhead Woolly Buggers, and nymphs. Lake Jindabyne:- Jindabyne has turned on some good polaroiding for some. The big high we had over us late last week gave ideal conditions for finding fish. 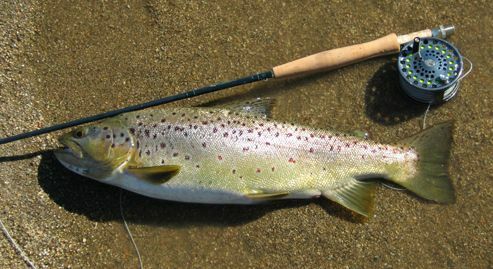 The fish don't appear to be widespread and with some of the reports we received, anglers failed to see any, while others saw good numbers. Best to cover as much ground as possible till you find them. The Eastern shore early in the day and the Western shore in the early to late afternoon. Here is the pic from Thursday, lots of ground covered, about a dozen fish seen, 2 fish landed out 6 or so shots. The usual winter polaroiding scenario, fish spook at the fly, spook at the fly landing anywhere within 6 metres, ignore it completely, look at it but won't eat it or attack it like they haven't eaten for weeks. I suppose this is why we keep going back. 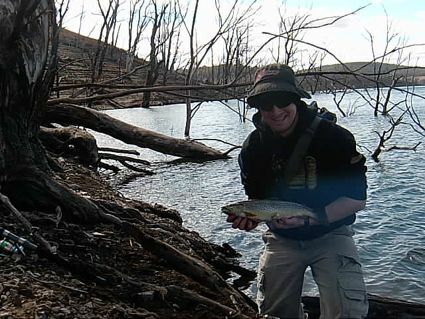 Eucumbene:- Trolling reports have excellent this week in Eucumbene with some good numbers and fantastic quality Rainbows being caught. *Pat Brennan and Dave from Canberra spent three days on the lake and managed thirteen fish in this time. The fish were widely spread and covering ground was the name of the game. The main basin proved the best overall area, and fishing in deeper section of the lake proved to be more successful than the edges. 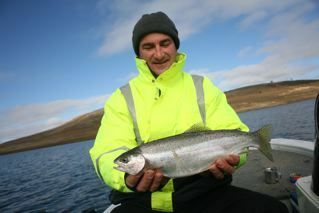 The Majority of the fish caught were Rainbows from 1-1.5kg and were very fat. A few Browns were caught on the Downrigger at 30ft, these were under a kilo. Best lures were Tassie Devils in # 36 and Rapala minnows in the MN colour. Flat lined # 36 and four to five colours of lead core proved effective as was the Downrigger. The other boat from the group with Peter and Kerry aboard did well also with twelve fish on a huge mixture of lures. Pat's other comment was don't forget the Winter woolies as it was very cold. *Anglers aboard another boat, were also reported to having taken eight fish in a session. Unfortunately, no other details are available at this time. Covering as much country as possible with a good array of different depth lures, fished at a good speed, should find a few fish. The Rainbows have been on Daphnia, so greenish and yellow wing lures are good options. Fish have been sounded at 30ft as a regular occurance this week, so fishing deep is a must. 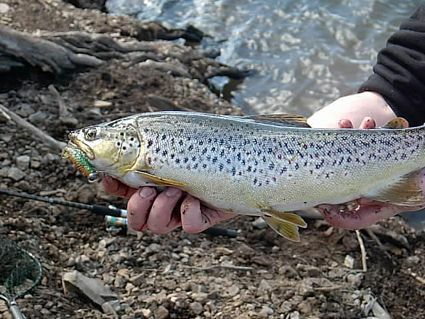 *Pat Seymore from Canberra and myself spent Saturday at the dam wall again catching a couple of nice browns in the sticks had a few nice fish follow right to the edge and a few takes but dropped. Squidgies again did the job. 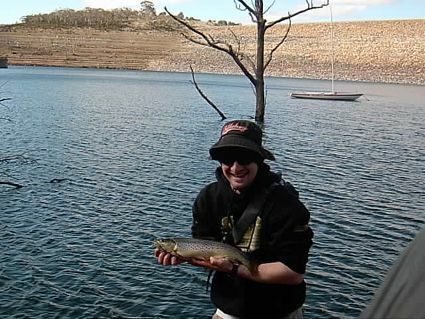 *Local angler John 'Scrubworm' Pene managed a nice Brown in the Old Adaminaby area last week. The fish took Power bait on the dropper rig.